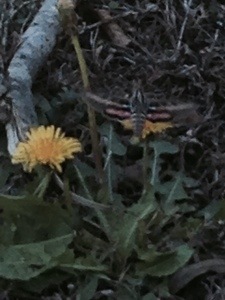 Saw this hummingbird moth today admiring one of my carefully tended dandelions. Unfortunately the mature form of the rightfully despised hornworm (those crazy looking caterpillars that will devastate your garden), I watched this insect hover by the flower, extend it’s proboscis and drink nectar. I’ll need to be diligent if I have any hope of my garden producing this year knowing creatures like these are ready for me. Next story How big was the Brady’s house?